Who Offers The Latest Version Of FleXcit Providing the Facts & Details on Britain’s eXit from The EU, to a standard of gravitas utterly missing from the scrabblings of campaigners seeking the nomination for the Electoral Commissions funding, and the opportunities for personal enrichment from ‘Data Mining’ via unregulated locations! With over 30,000 downloads of previous editions, this is already having a significant impact on the debate, evidenced by the fact that the prime minister and others are going out of their way to attack the “Norway Option”, when it is only this blog and Flexcit which are really promoting this option. None of the main “leave” campaigns have endorsed it, and very few others are pushing it. Thus, for all their arrogant assumptions about setting the pace, it is to us that the “remains” are directing their attention – and unsurprisingly so as Flexcit represents the only credible and coherent attempt at producing a structured exit plan. I’ve got to the stage now, though, where I am amused by the convoluted attempts of the legacy media and the self-appointed Vote Leave Ltd (among others) to ignore our plan. It even gets to the point where sympathetic journalists (including Booker) who name me in their pieces, find my name and any reference to my work removed by orders from on high. Nevertheless, despite this pettiness, the Flexcit message is getting through. And in this edition we further refine the withdrawal strategy, grouping three options under the single heading of the “Market Solution”, indicative of one of the core elements – protecting our participation in the Single Market as an interim measure. What a lot of our critics have never realised is that there have always been two options in this grouping – right from the very start. We offered the “Norway Option” as the baseline, but in the event that we were blocked either from EFTA or EEA participation, we detail the so-called “shadow EEA”, which gives us the equivalent package, but framed as a stand-alone bilateral agreement. Newly added is the third option, which we call the “Australian process” – a unilateral declaration of regulatory convergence (and a commitment to maintain it), backed by a formal Mutual Recognition Agreement (MRA) on conformity assessment. The particular advantage of the “Australian process” is that it provides the basis of a deal in the event that the EEA is broken up, with the EU offering EFTA (and other) states a form of associate membership. The crucial element of the “Market Solution”, however, is that it is an interim solution – intended only to facilitate a trouble-free, and speedy extraction from the EU, buying time to develop a longer-term settlement. Most other pundits, offering their own (inferior) plans, then to stop at this point, whereasFlexcit continues to make it clear that withdrawal from the EU is not an event but a process. As to the future, we will of course, continue working on the document. It is and always has been a “living document”, gradually evolving and taking on board comments and constructive criticism. Readers already familiar with the contents will notice many small updates and changes, and the text has been altered to reflect the change in the referendum question from “yes-no” to “remain-leave”. I will continue the updating process and, in due course, will be publishing yet another edition. We make no apologies for this. The collective expertise of the contributors to this work exceeds that available to the totality of the current, formal “leave” groups and their hangers-on. 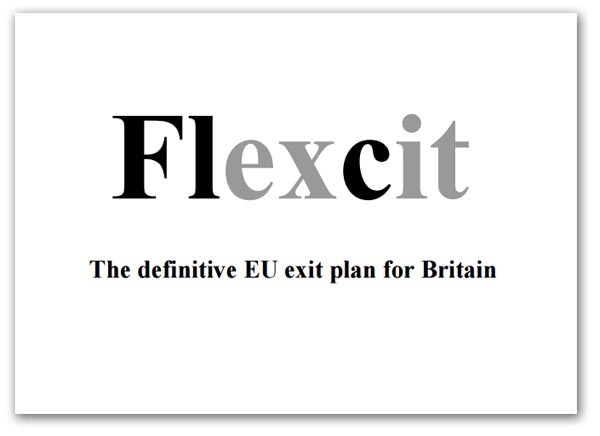 By a country mile, Flexcit remains the best, most comprehensive exit plan available, and the determination of the media and others to ignore it says more about them and their own limitations than it does about us. Previous Previous post: BBC To Spend OUR Money Training Staff To Avoid Seeming Biased pro EU!